Their loyalty is one of the reasons we love our dogs so much. There are very few animals on this earth that devote themselves to us humans, quite they way that dogs do. Thankfully, more often that not, we are pretty good at reciprocating that love. And this story is a fine example of the bond that occurs when we do. 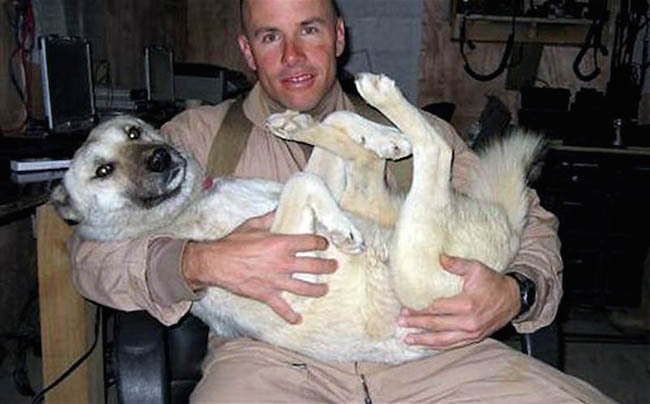 Back in 2007, when Maj. Brian Dennis was on a tour of duty in Iraq he spotted a scruffy German Shepard-Border collie mix living in one of the Iraqi border forts the unit patrolled. ‘At first the dog wasn’t interested in making friends’, the marine explained to his mother in emails home. The dog was suspicious of humans. He lived in the wild with a pack of desert canine companions, and it was evident in his condition that he had already been through a lifetime’s worth of pain and neglect. His ears had been cut off as a puppy, and he had been trained as a fighting dog. Now free from his tormentors, he did not want to interact with people. However, Dennis saw something special in the dog. Because of his missing ears, he gave him the nickname ‘Nubs’. Dennis was patient with Nubs, taking small steps to earn his trust every time they visited the fort. Eventually, he was able to get the dog to eat out of his hands. Their friendship slowly developed, until one day Nubs showed up with a deep wound in his side. Someone, somewhere had stabbed the dog in the stomach with a screwdriver. Dennis immediately did all he could to fix up the dog, nursing him back to health over a number of weeks. From that point on, Dennis and Nubs were inseparable. Sadly, the time came when Dennis’ unit was forced to relocate to a new base. His superiors said that Nubs would not be allowed to join him. In his emails, the contents of which were later reported by ABC News, Dennis described what it felt like to watch as Nubs raced alongside the convoy, even attempting to jump in the back of one of the utility trailers as his unit drove away from the fort for the last time. It was heart breaking, and he was positive he would never see the dog again. However, just two days later, a familiar face turned up at Dennis’ new base. 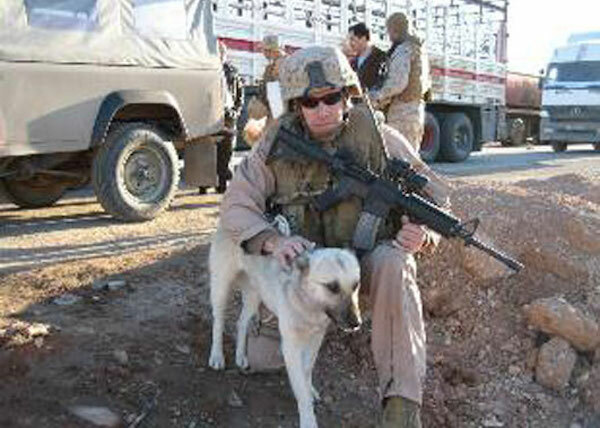 Somehow, Nubs had managed to follow the trail of the Marine unit through the Iraqi desert. The base was 70 miles away and the dog had travelled through unimaginable conditions to get there. 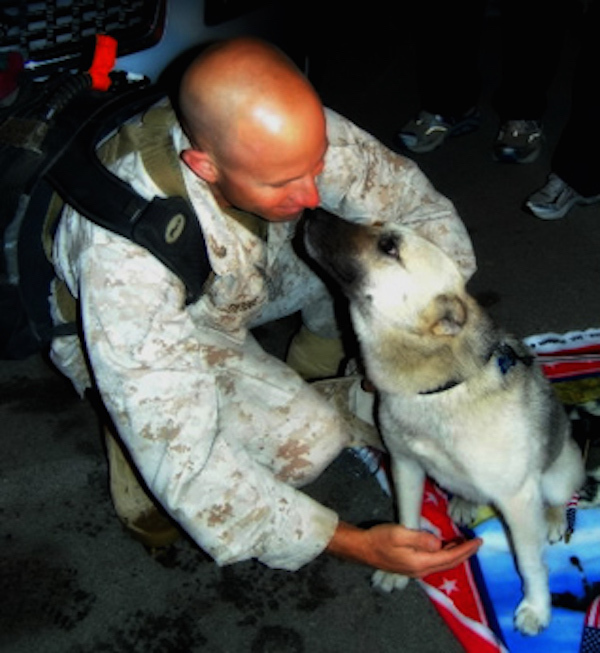 Although it was against military protocol, Dennis’ unit did make efforts to give the dog a home. A doghouse was built at the new camp, but they were quickly informed by the military police that Nubs would have to live elsewhere. At this point, Dennis made the executive decision to do all that he could to take Nubs home to the United States with him. “This dog who had been through a lifetime of fighting, war, abuse, and had tracked down our team over 70 miles of harsh desert was going to live the good life,” Dennis wrote. 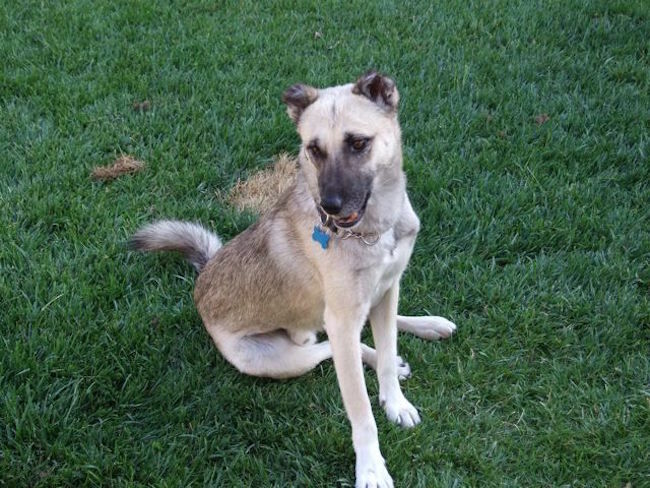 In February 2008, the dog crossed the border out of Iraq and into Jordan, where friends of Dennis were waiting for them. There, Nubs received the proper vaccinations so that he could be transported back to San Diego where Dennis was stationed when on home soil. And there, the good life for Nubs truly began. Living with Dennis he has been able to play on Dog Beach, be fed gourmet dog food, and bask in the Californian sunlight, far, far away from the harsh brutality he had experienced in the war torn Iraqi desert.